Not to be confused with Euphorbia peplis, Purple spurge, a relatively rare plant of coastal sand and shingle. For other uses of "milkweed", see milkweed (disambiguation). Euphorbia peplus (petty spurge, radium weed, cancer weed, or milkweed) is a species of Euphorbia, native to most of Europe, northern Africa, and western Asia, where it typically grows in cultivated arable land, gardens, and other disturbed land. 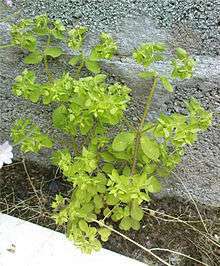 It is an annual plant growing to between 5–30 cm tall (most plants growing as weeds of cultivation tend towards the smaller end), with smooth hairless stems. The leaves are oval-acute, 1–3 cm long, with a smooth margin. It has green flowers in three-rayed umbels. The glands, typical of the Euphorbiaceae, are kidney-shaped with long thin horns. The plant's sap is toxic to rapidly replicating human tissue, and has long been used as a traditional remedy for common skin lesions, including cancer. The active ingredient in the sap is a diterpene ester called ingenol mebutate. A pharmaceutical-grade ingenol mebutate gel has approval from the US Food and Drug Administration for treatment of actinic keratosis. 1 2 3 "Germplasm Resources Information Network". 1 2 3 4 Hazel Dempster; Bronwen Keighery; Greg Keighery; Rod Randall; Bob Dixon; Bill Betts; Margo O'Byrne; Diane Matthews. "Euphorbia terracina Workshop Proceedings 2000" (PDF). 1 2 Siller G, Gebauer K, Welburn P, Katsamas J, Ogbourne SM (2009). "PEP005 (ingenol mebutate) gel, a novel agent for the treatment of actinic keratosis: results of a randomized, double-blind, vehicle-controlled, multicentre, phase IIa study". Australas J Dermatol. 50 (1): 16–22. doi:10.1111/j.1440-0960.2008.00497.x. PMID 19178487. ↑ Lebwohl, M, et al. "Ingenol Mebutate Gel for Actinic Keratosis." N Engl J Med 366;11, March 15, 2012. ↑ "FDA Approves Picato® (ingenol mebutate) Gel, the First and Only Topical Actinic Keratosis (AK) Therapy With 2 or 3 Consecutive Days of Once-Daily Dosing". eMedicine. Yahoo! Finance. January 25, 2012. Wikimedia Commons has media related to Euphorbia peplus.